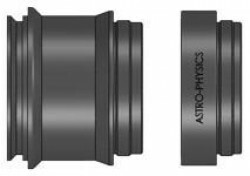 Conveniently, it uses the same camera adapters as the Quad TCC (and those of the flatteners and TCCs of the 160 and 175 Starfires). Machined aluminum covers are included. Important Note: If you are upgrading your 130 EDFGT scope from the 2.7” to the 3.5” focuser and already own the 67PF562 Field Flattener, the optics can be transferred into the new 3.5” housing, however it is not necessary to do so since the original housing can also be used with the 3.5" focuser.